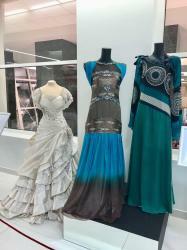 Three dresses by fashion designer Fakhriya Khalafova have been presented in St. Petersburg's State Hermitage Museum. The exhibition "Costume History" opened in museum's the Staraya Derevnya Restoration and Storage Centre on December 8, Trend Life reported. "Within the framework of the project - Costume Gallery, it is planned to create an International Research and Training Center where it will be possible to learn all the variety of works by designers of the past and the present, representing different peoples and trends of fashion. This center will host master classes by famous designers who will share their experience and knowledge, including me as an assistant professor of modeling at the Azerbaijan State University of Culture and Arts, " said Fahriya Khalafova. Notably, an agreement was signed between the director of the State Hermitage Museum, the academician of the Russian Academy of Sciences Mikhail Piotrovsky and Fakhriya Khalafova in St. Petersburg on December 5. Within the framework of the agreement, three dresses from designer's collections will be presented at the "Costume History" exhibition, which will open on December 8 at the State Hermitage Museum, and then enters the museum's fund. 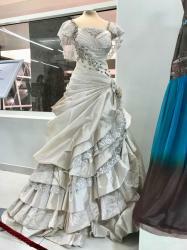 "Costume History" exhibition was organized as part of the State Hermitage museum birthday. The museum celebrated its birthday on December 7- the day of St. Catherine. This is a tribute to the founder of the museum Catherine II, known as Catherine the Great. The director of the State Hermitage Museum Mikhail Piotrovsky stressed that costume gallery will be a starting point for the new museum.